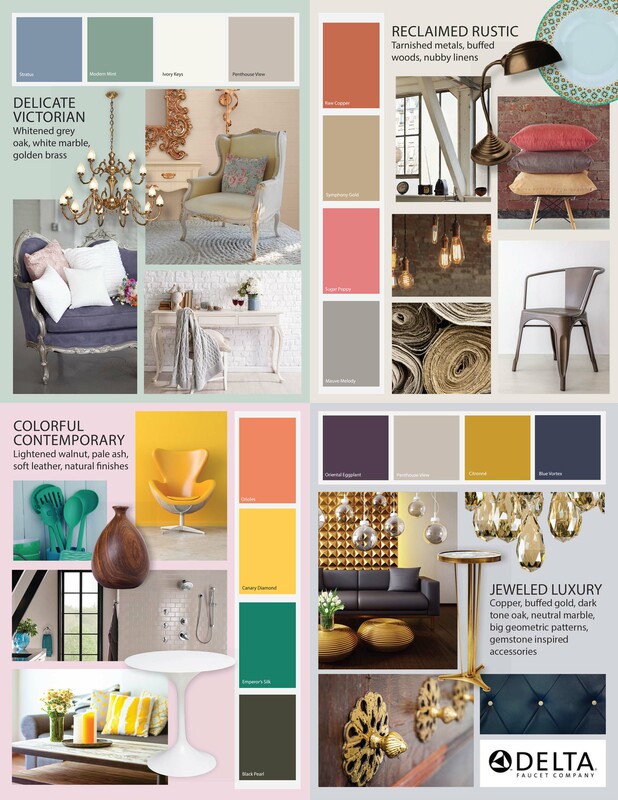 The Delta Faucet Company industrial design team highlights the leading style preferences in its 2016 interior design trend report, capturing a range of looks, from soft, graceful patterns to bold, jewel-inspired furnishings. Knowledge of the latest trends within this ever-changing industry remains a top priority for the company as homeowners, designers and builders seek ways to reinvent their living spaces. Delicate Victorian: Graceful patterns, subtle pastel hues and white-washed woods work together to create a timeless Victorian-era aesthetic with a softer touch. This classic design has a place in modern spaces when traditional accents like delicate filigree patterns and soft colors are placed in open concept designs. Homeowners accessorize through feminine-shaped vases, rose gold accents, golden brass finishes, and patterned textiles. Within this trend, the team sees an emphasis on floral and hexagonal patterns that truly bring the understated, elegant style to life. Reclaimed Rustic: Cool metals combine with warm botanical patterns to create the perfect blend of strong, industrial design with country comfort. Tarnished metals and textured stone juxtaposed against repurposed wood, nubby linens or country silks create rugged-yet-comfortable spaces. Reclaimed wood accents, bursts of poppy and browned brass finishes bring a balance of warmth to the cool, modern metals. 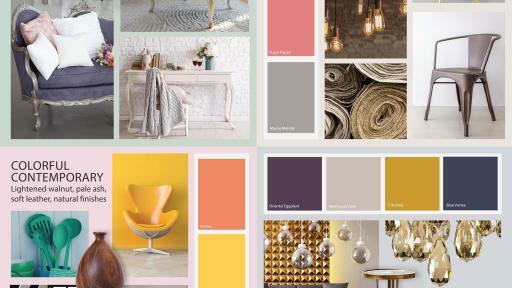 Colorful Contemporary: Soft, geometric shapes accompany bright hues and natural fabrics for a cheerful, modern look. Influenced by mid-century aesthetics, this design sits squarely at the intersection of urban and suburban. Stylized subway tile and playfully shaped furniture in loud colors like coral or bright yellow are on the rise. Homeowners with a desire for additional natural elements may consider lightened, walnut wood accents or even copper framed storage units with pale ash shelving. Jeweled Luxury: Deep purple and navy hues, angular patterns and polished chrome finishes all create a luxurious look. Taking elements from both modern and traditional design, this look incorporates clean, geometric shapes and open, wirework furniture with faceted surfaces and marble flooring. Jewel-inspired details and finishes in buffed gold with subtle iridescences give the sense of long-lasting opulence.